In a small, specially-built laboratory at the Mission Creek Corrections Center for Women, an incarcerated technician feeds a tiny butterfly with a cotton swab. The butterfly, with a fuzzy grey-brown body, orange face and antenna, and orange, white and black checker-pattern wings is an endangered Taylor’s Checkerspot Butterfly. 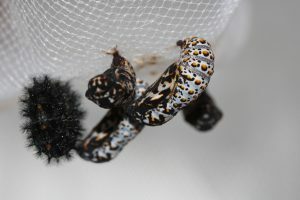 Over a year, incarcerated technicians will care for the Checkerspots, collecting data and maintaining optimal conditions at all stages of growth so a new generation of caterpillars can be released into native prairie habitat to help restore their numbers. But a population increase in endangered butterflies is just one of the significant impacts that has come out of the Sustainability in Prisons Project (SPP), a special collaboration between the Washington Department of Corrections and The Evergreen State College says Master of Environmental Studies (MES) student, Keegan Curry. For more than a decade, the mission of SPP has been “to empower sustainable change by bringing nature, science, and environmental education into prisons.” Some of the rewards the SPP partnership offers include: mountains of data and research for scientific and academic communities; education and training; new-found purpose and empowerment for incarcerated individuals; opportunities for Evergreen students to work on social and environmental issues; and collaborations between state, federal, and educational partners. The butterfly program is the accumulation of many years of hard work, Keegan explains. In 2011, the SPP partnered with the Washington Department of Fish and Wildlife, the Oregon Zoo, U.S. Fish and Wildlife, and the Department of Defense, to bring a butterfly-rearing facility to Mission Creek Corrections Center for Women, a minimum-security prison in Belfair. “The partnership was an opportunity to take captive rearing activities at the Oregon Zoo and implement the same protocols and training at the prison,” says Keegan. 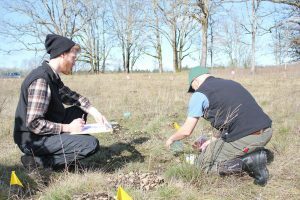 The collaboration relied on state biologists, zoo keepers, DOC staff, and Evergreen students supporting the incarcerated technicians as they gained skills and education all while helping restore an endangered butterfly species to the wild. With only one percent of it’s native habitat remaining, the Taylor’s Checkerspot Butterfly has a long road to recovery ahead of it. The Taylor’s Checkerspot lives on prairies and oak woodlands in the Pacific Northwest region. “Almost 99 percent of those prairies have been developed for housing, agriculture or other uses,” says Keegan. 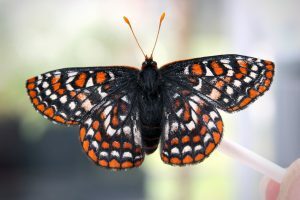 “Only about one percent of the Taylor’s Checkerspot’s historic habitat remains, and what remains is in isolated areas, at risk for degradation.” In Washington, there are about eight populations remaining overall, and the single largest of the remaining populations is on Joint Base Lewis McChord (JBLM). “JBLM has been very supportive of the recovery efforts for this butterfly,” Keegan adds. A captive rearing program takes species that are threatened or endangered in the wild, in this case, the Taylor’s Checkerspot Butterfly, and raises them in captivity then releases the species into the wild to help repopulate areas where the species has faced declining numbers. This work is time consuming and laborious, and requires dedication on the part of the scientific technicians. Unlike a typical prison work program, this is first and foremost an educational internship. As the incarcerated technicians begin to see the importance of the education, training and work that they do, and as they realize how valued they are, they find a sense of purpose and fulfillment. Keegan explains that he and other scientific support staff are not able to be at the prison to supervise the work every day, so they leave it in the hands of the incarcerated technicians and DOC support staff. “They have to work independently and sometimes solve complex problems, and they do it really well,” he says. 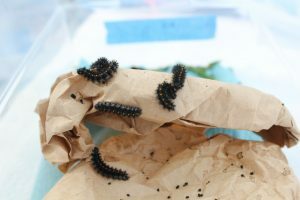 Since 2011, incarcerated technicians at Mission Creek have successfully raised over 18,000 captive butterflies for release in their caterpillar form. The Taylor’s Checkerspot Rearing Program has been an example of successful collaboration. “It’s proven to be a model for the Department of Fish and Wildlife, other conservation partners, and the DOC in working together to find novel solutions to social and environmental problems,” says Keegan. As an MES student, Keegan works with SPP and has spent the last two and a half years pouring over the data collected in the captive rearing program. 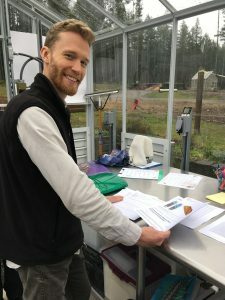 Instead of building a study from the ground up and collecting data over a year or so, Keegan is able to look at nearly a decade’s worth of data collected by the incarcerated technicians at Mission Creek along with data from the butterfly lab at the Oregon Zoo. “This data is a goldmine of biological information that can help researchers understand more about the butterfly’s behavior and biology in the field.” Keegan is the second MES Thesis on the butterfly program to come out of SPP. Working with the SPP through the MES program at Evergreen puts students at the intersection of environmental and social issues, says Keegan, and it presents grad students with real-world challenges in how to apply the principles learned in the classroom, he adds. At any given time, there are between 5 and 10 students collaborating with the SPP as they work towards their Master’s Degree at Evergreen. And it’s not just butterflies. Across the state, in all 12 prisons, the SPP is involved with incarcerated individuals, helping them find encouragement and purpose. Partnerships across organizations and agencies are being formed and strengthened. Data is being collected. And the health of damaged ecosystems continues to improve.